I have never had this bier before. 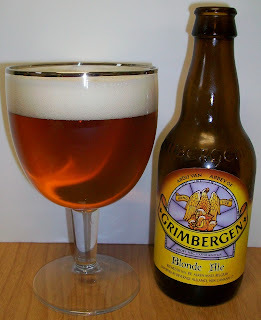 My friend Andre gave me the Grimbergen Dubbel to review and I really liked it. I saw the blond at the store and couldn’t help myself but to buy a 6 pack and review it. So here we go. 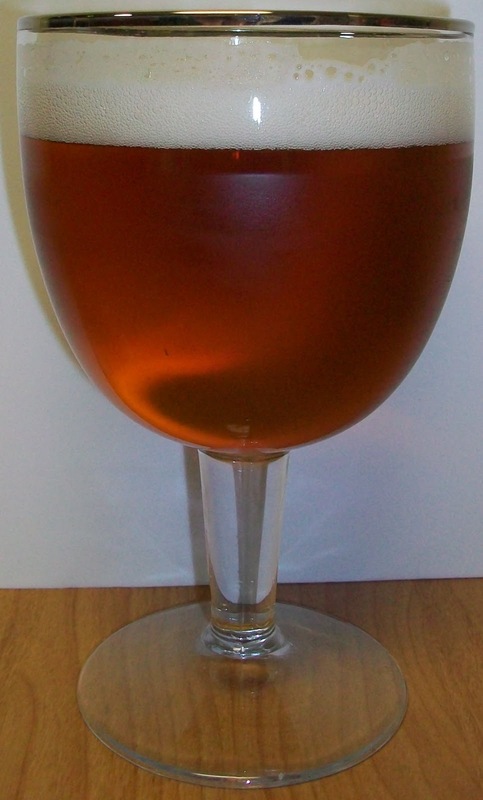 The bier pours a clear golden color with copper hues and a bright white head. Pale malts, light fruit, citrus, light spice and yeasty notes make up the nose of this bier. It is very inviting. The nose is extremely inviting I just hope that this is as refreshing as the nose leads you to believe. Wow, this is every bit as refreshing as the nose indicates; what a nice Blonde. This is clean crisp and refreshing. We start out with very light malt sweetness up front on the tip of the tongue followed by a very pleasant effervescence over the tongue in mid-sip. There is not much going on in the middle of the sip other than some combination. The back-end is extremely easy drinking with light carbonation release during the swallow. The finish is superb for a Blonde. It remains very clean and refreshing but with very nice light malt flavors, a hint of spice and just enough hops to give a somewhat dry finish. There is not much of a lingering aftertaste just a hint of citrus and light malt sweetness. I’m sure glad I bought a 6 pack of this because this first one is gone. That’s one problem I have reviewing a refreshing bier, it doesn’t stay around to long. I also have to mention the impressive lacing. The head seemed to diminish fairly quickly to just a protective thin layer over the top of the bier. But the lacing remained very impressive for a blond. From the lacing on the glass you can clearly see the new level after each sip. Again this first glass did not have too many level marks since it went down so easily. I’ve managed to let this second bottle warm up a little. We are now at 57 degrees and it is still delicious and refreshing; it may actually be a little smoother now and the light malt flavors are more pronounced. Granted it is still light, it is a blond after all. It’s hard to get excited about a Blonde but this one has everything going for it. It is light with a nice carbonation, slightly sweet with light malts, just a hint of spice, citrus and very refreshing. I’m going to have to give this one a A for sure. I'm not sure if I stated it in the review but I liked this one more then Leffe. And Leffe is my everyday Belgian. But since Leffe is distributed by InBev it is widely available and much cheaper. So I'll probably drink more Leffe than Grimbergen.